In the past year and a half, many current students, in addition to the exorbitant amount of MC alumni, have no doubt noticed the great facelift that has occurred in the school’s alumni affairs department. The changes that have taken place are largely due to the efforts of MC’s Director of Alumni Affairs, Lance Clay. From establishing a Student-Alumni Association to developing plans for an electronic Alumni Newsletter, Clay has made great strides in improving school relations with young alumni and strengthening ties with the older graduates. 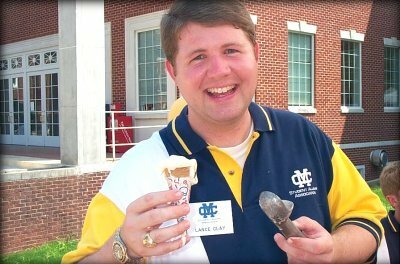 Lance Clay, a native of Greenville, Miss., recalls that his first experience at Mississippi College was an R.A. Day football game-Choctaws versus Valdosta State. “I remember I fell in love with the big golden dome. Then, at the game, some kid ate a chili dog and threw-up all over my new blue jeans. We had to leave early,” explained Clay. At about the age of twelve, Clay’s family moved to the Jackson area. When making his college decision, Clay considered MC but opted to spend two years at Hinds Community College before attending a four-year school. Being hugely influenced by then Vice President of Alumni Affairs, Doc Quick, and Public Relations Director Norman Gough, Clay transferred to MC his junior year. Although the facilities were less appealing than they are today-as Clay soon discovered, a normal means of communication in Ratliff Hall involved residents leaving notes for one another in the form of wall graffiti-Clay was struck by a community, family-like atmosphere. “Doc Quick took me into his office and told me, ‘Here at MC, you’ll find the best people in the world.’ That really sold me on MC,” said Clay. As a student at MC, Clay and his roommate, Brian Hill, became known for their weekly Monday night wrestling parties. During these parties, Clay and Hill often served “lucky dogs” cooked on a hot plate. According to legend, you were lucky if you could eat two. This tradition also led to Hill’s attaining his well-known nickname, Lucky B. One should note as a point of interest that Clay and Lucky B. were residents of Chrestman Hall, as it was a men’s dorm. Apparently in great need of a renovation at the time, Clay recalls that the community showers of the dorm were affectionately referred to as Auschwitz. Clay graduated in 1995 with a B.S. in Communications with an emphasis in Mass Media and an English minor. “My favorite teachers were probably Mrs. Lassiter and Dr. Lytal, but I learned just as many valuable things by simply observing life on campus. I saw so many sides of different issues,” said Clay.